Our latest downloadable Moodle course template is focussed on using Moodle for business, rather than in the education sector. Over the last few months, we’ve had a large increase in the number of corporate clients that we work with. Moodle usage in businesses is often substantially different than in educational environments and the number of Moodle resources available for businesses is less than those for education. To begin to correct this imbalance we’ve created a free course template aimed at companies using Moodle for business. 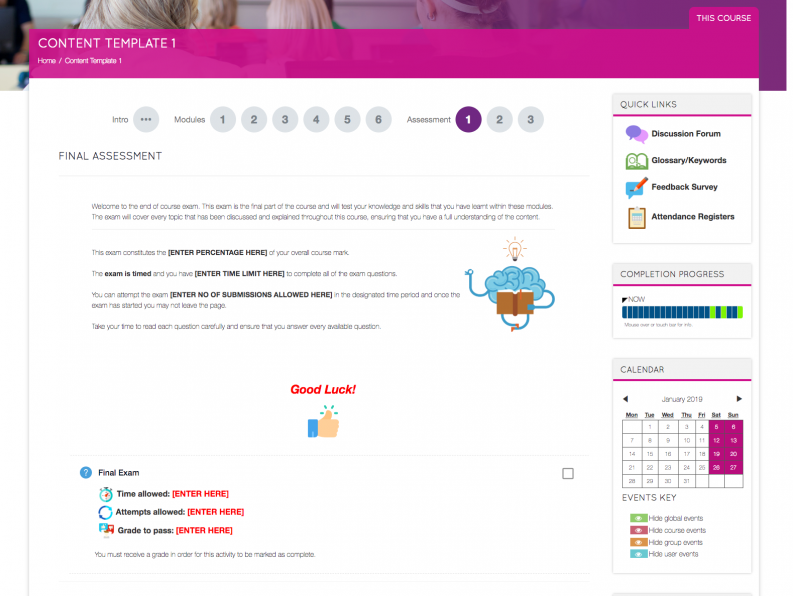 This template is available in two different layouts (‘buttons’ format and ‘tiles’ format) and includes example certificates, example self-assessment feedback forms, example course feedback questionnaires and much more. Course Introduction – A welcome area to introduce your learners to the content they will be studying (listing the syllabus) and introduce suitable methods of communication. It is also home to a discussion forum for learners to collaborate with one another and can also be used for course convenors or trainers to post updates. Quick Links Block – A clear block easy to locate that contains key links to areas such as the discussion forum, glossary/keywords area, feedback survey and attendance registers for tutors to log against any workshop/classroom sessions. Completion Progress – A block displaying the course progress made by the logged in user. Trainers have a link to view an overview of all learners. Calendar & Upcoming Events – A calendar and upcoming events block to show any upcoming classroom sessions booked in. Useful Supporting Documents – A block that can be used to add key files that will help learners throughout this course. File Resources – To allow learners to view and/or download PDFs, Word documents etc to their local machine. Assignments – A great way to create tasks or followup work for learners to complete within the platform or upload offline assignments. The Feedback tools can then be used to highlight, add stickers, comments, and more, all within the platform. Feedback – A great way to ask simple questions or ask for feedback on modules or an entire course. Using Restrict Access you can prevent learners from continuing until they have provided feedback. SCORM – A popular content standard. SCORM packages are created or purchased externally and can then be imported into the LMS. Interactive Content (H5P) – A fantastic plugin providing a vast array of content types to breathe life into the platform over typically static and lifeless content. These include interactive course presentations and videos. Questionnaire – An in-depth way of asking for course-specific feedback using a series of multiple choice or scale based questions. Final Assessment/Exam – An area containing information about the final assessment method for this course (e.g. a quiz). Key information can be listed such as the time allowed for the assessment, number of attempts allowed and the grade required to pass. Certification – If a user is successful they will gain access to download their own certificate, either as a digital or printable copy. 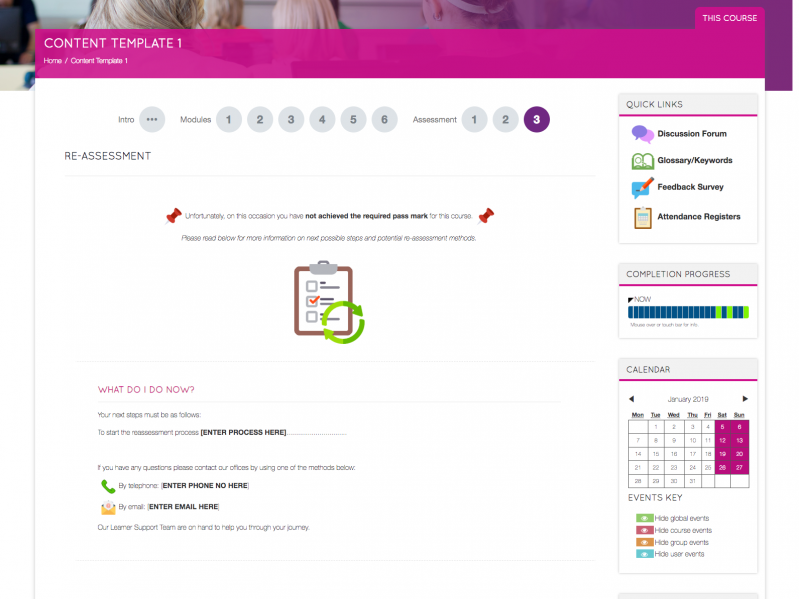 Re-assessment Area – If a user is not successful and they have no remaining attempts at the final quiz, they may need further information on how they can proceed. For example, they may need to make a payment for a re-assessment or you may ask them to contact a member of the training team for assistance. Allow stealth activities – This setting allows you to hide activities and resources on the course page to keep things tidy. For example, in the course content template, the quick links block links to attendance registers which only shows to learners in the Quick Links block and not on the course page itself. Global search (Simple search) – Allowing users to search through the activities and resources available in the course. Restrict Access – You can use the Restrict Access functionality to ensure learners follow the course sequentially. This means future modules can’t be accessed until prior modules have been fully completed. You can also hide final end of course exams, certification areas, re-assessment information and more. If you would like to download the template, the link below will take you to our Titus Community site. 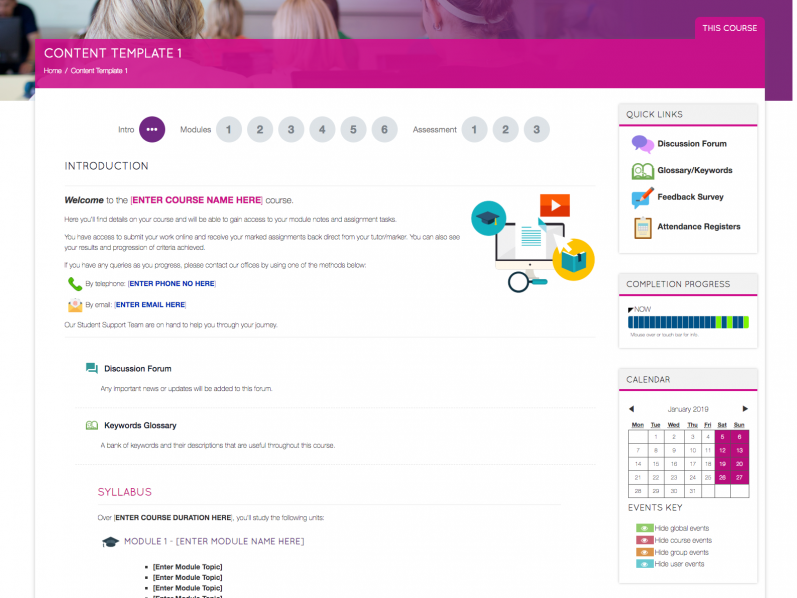 Click ‘Download: Course Template’ to download the course in either the ‘buttons’ format or ‘tiles’ format. (We recommend “Tiles”). 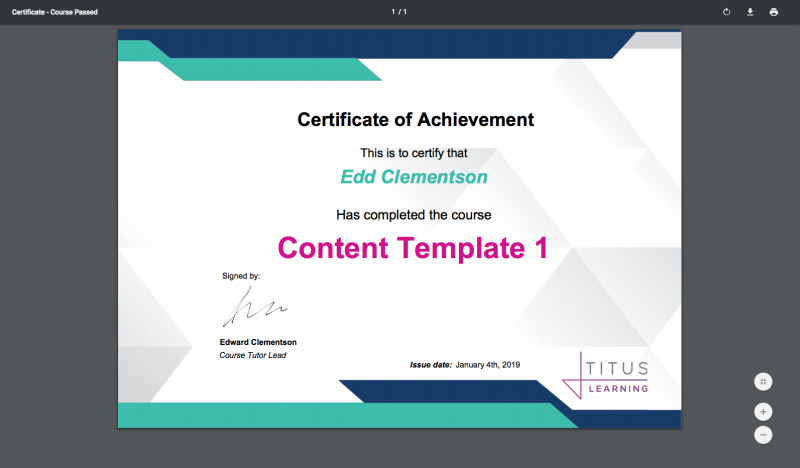 We hope you get as much use out of this as we have, and for any assistance with Moodle plugins or using the Moodle for business template, you can also contact the team at Titus Learning – we’re always happy to help with any Moodle query however big or small.